Now this is a pretty cool find by ILoveFreeSoftware… Remember WinAmp? Well here is an online version. Here is an really nice, lightweight, and simple Android app (with advanced features), called Musicolet, that plays music files (mp3 etc) that you may already have in your personal collection. Musicolet does not support internet-based music streaming and as a result requires no internet related permissions or connections. It is 100% FREE with no ads. Musicolet has become my go to music player when it comes to playing my personal music files. Harmony is a free desktop music player for Windows to stream music from Spotify, SoundCloud, Play Music, Last.fm, Deezer, and Hyper Machine. If you are into minimalistic and portable, then take a look at Kaseto… This music app is a work in progress. I am seeing more and more music downloaders. This one is called MusicWire, and what I like about MusicWire is that it is a portable app. MusicWire is a free application you can use to easily search for and download MP3 files. The app allows you to search for audio books and music files from different places on the web, giving you access to over 100,000,000 MP3 files… MusicWire has a more modern interface than some of the other downloaders I have tried; has the ability to perform simultaneous downloads; AND, allows you to test and play the downloaded songs. You also have option in the settings to select the download folder. I don’t know what it is, but as long as I have been working with software (and now apps), if it looks good, I like it. The Dub Music Player + Equalizer is no exception. Instead of the flat look that developers are working toward, Dub Music Player + Equalizer has a simple, effective and real-like interface that sports an awesome looking vue meter. I am not into playlists and I like the idea with this player I can select a folder of music and it will play the contents of the folder. Enjoy your music in a new way. You can also save your custom preset. Bass Boost and Virtualizer effects will further amplify and enrich the sound on your Android devices. √ Simple and effective interface, faithfully showing visualization of your music played. √ Supports headset / Bluetooth controls. Create Online Music Playlists And Share Them With Your Friends (Without Breaking Any Laws??? )… That is what YOUZEEK is claiming on their “About” page. YOUZEEK is a FREE online (cloud based) music application. With YOUZEEK, you can play music, discover or re-discover artists and bands, find music by country and by genre. According to their “About” page, YOUZEEK and its users, keep it legal, by not storing any copyrighted content and relies on legal sources such as YouTube. I am still learning to navigate the YOUZEEK site, and do have some unanswered questions; however, what I am seeing is awesome (like making selections, creating playlists, watching the corresponding music videos, a music room to instantly share music with others, etc…). To get full benefit of YOUZEEK, it is best to set up an account (which is FREE). YOUZEEK is available through your web browser (at youzeek.com); available as a Google Chrome App; and, available as an app on the following mobile platforms (Android, Amazon Kindle Fire, Apple iPhone, and Apple iPad). Steve over at his site, Scoroncocolo, always drops me a line when he composes a new tech article. This time around he has researched and drafted an article about the Amazon Cloud Drive Music Player that he has asked that I share with you. When it comes to software I prefer what is called the K.I.S.S. prinicple. An example of where the K.I.S.S. principle has been applied in a software design is the mp3 (and wma) player called ARMP 2011 – A Random Music Player. It is nothing pretty to look at, but if you want simplicity that gets the job done, ARMP 2011 is a winner. Most players, to the everyday computer user can be quite confusing to use and hard to navigate. Often the user has to create and maintain playlists and tags to play their music. With ARMP 2011 you simply select the folder where your music is located and ARMP 2011 will automatically generate a list of the music that is in the folder and will randomly start playing the music. At anytime, you can click on any selection in the list and ARMP 2011 will jump immediately to that selection (just like a DJ). ARMP 2011 will remember the folder you selected each time you use it and the folder selection can be easily changed. I currently use this app on my media center setup, in my living rm, that I currently working on. Most of the music players that I have experienced look good in appearance; but, in the end I find them overextended with features that end up being a big turn off and difficult to navigate. 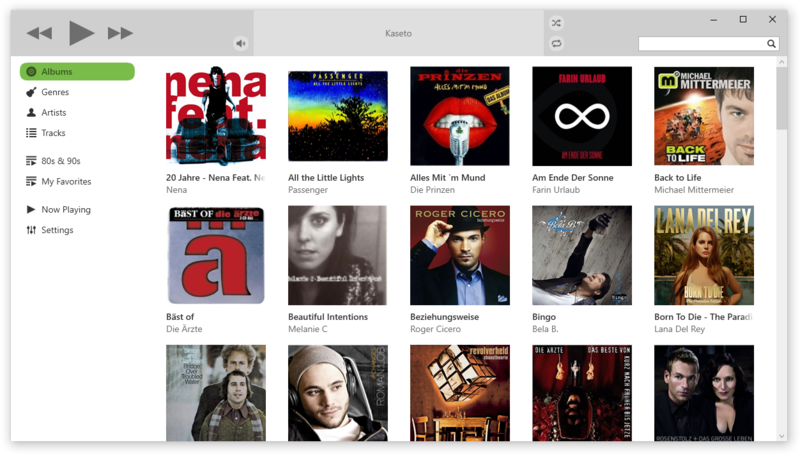 One music player that I have been following for close to 2 years is Spider Player – The Ultimate Music Player. Spider Player has an easy to use interface with the tools you need, such as a ripper and converter, readily available in a dropdown menu. Spider Player also features an awesome online radio directory that is downloaded directly to your PC and updates on a regular basis. This is a nice little music player that can either installed on your PC or can be installed on your flash drive as a portable app. Assign up to four local or global hotkeys of your choice to any program’s action and have all of the tools and functions at your fingertips. Multimedia keyboards are supported as well as regular ones. Any supported audio file (see the list of supported audio formats above) or Audio CD track can be easily encoded to MP3, WMA, OGG, FLAC or WavPack format. Basic version allows to encode only one track at a time, while PRO version can be used for batch encoding. With Spider Player PRO you can also use any command-line encoder with STDIN support. There is even a help on encoders’ command line options and a preset manager. RadioTuna is a cloud app that brings internet radio to your desktop via their online presence and easy to understand interface. In the past I normally installed software on my PC to search for and bookmark my online stations; however, RadioTuna eliminates the need to do that. Can bookmark your stations (for future reference) that can be accessed anywhere there is internet access. Album art is displayed as the songs are playing to enhance, not only the listening experience, but the visual experience, as well. Very powerful internet radio search engine. RadioTuna is the first real-time search engine for online radio, giving up-to-the-minute results relating to the music being played across the globe right now. If you search for an artist that happens to be playing right now, we’ll tell you and you can connect straight to that station. If your choice isn’t playing right now, we’ll tell you which stations are most likely to play them next. If you have an USB Mass Storage device (external hard drive or USB flash drive for that matter), here is a device made by Western Digital, called “WD TV HD Media Player” , that serves as a bridge between an USB Mass Storage Device and your television. You connect the “WD TV HD Media Player” to your television and the USB Mass storage device to the WD TV HD Media Player (see below). The connection to the TV is accomplished either using standard video/audio composite cables (which are included) OR via a HDMI cable (high def cable). What does this all mean? Many of us have movies, music and photos stored on external hard drives and really no way of accessing them; except, through the computer. This device changes all of that. I purchased a “WD TV HD Media Player” (on sale for $99.00; normally $129.99 at my local BestBuy) to play around with and to ultimately determine if it was possible for the WD TV HD Media Player to read photos, movies, and music files from a “portable flash drive”. The WD TV HD Media Player supports a multitude of video, graphic and music file formats. My thinking with this device is that with a flash drive I could still store a consider amount of photos, music and a movie or two AND make this device modular and mobile. In my case, fill the flash drive, plug in the flash drive to the WD TV HD Media Player, and watch the media on my TV (especially the movies). When I got the WD TV HD Media Player home, I found it packaged very nicely, with a remote control, batteries, composite cables, an installation guide, power supply, and a CD (ArcSoft MediaConverter and Western Digital Info). The WD TV HD Media Player is a very compact unit (1.5 “H X 4 3/4” W x 4” D) with a black glossy shell. In my situation I opted to purchase the HDMI cable to make the connection to my TV. This alone helped alleviate some cable clutter. After I unpackaged the WD TV HD Media Player, I had it hooked up and ready to go within 10 minutes. After loading a 1 Gig flash drive with a divx movie, some music and some photos, I plugged the flash drive into the WD TV HD Media Player. The WD TV HD Media Player is designed with (2)-two USB ports. After inputting my TV to the HDMI input (via the TV remote), I then switched to the WD TV HD Media Player remote and powered up the WD TV HD Media Player . WD TV HD Media Player immediately recognized my flash drive and the content (movies, music and photos). The WD TV HD Media Player menu is very slick in appearance and navigation with the remote was breeze. I found that the WD TV HD Media Player handled the movies, music and photos with no problems. The only issue I experienced is when I placed the WD TV HD Media Player unit in a vertical position, the flash drive seemed to lose its’ connection; otherwise when the WD TV HD Media Player was lying horizontal I experienced no problem whatsoever. My next step is to purchase an 8 or 16 Gig flash drive to use with this device. You can read more about “WD TV HD Media Player” by clicking on the links below. The Windows Media Player, in my opinion, “is a bloated, hard to understand, does not play well with others, likes to tell on you, hooks into your operating system, mediocre” media player. Sorry Microsoft, but myself and legions of others like “simplicity, easy to follow, will play anything, respects our privacy, can be deleted if we don’t like it, above average” media player. I didn’t mean to start this post out so blatant, but I want you to know there are other media player options available. If you are looking for an alternative “FREE” media player with simplicity in mind, that works across many platforms (i.e. Windows, Mac, Linux, BeOS, Syllable, & others) and will play just about anything that you throw at it; then give VideoLan –VLC media player a try. I have been using this player for approximately 2 years and it has not let me down. I initially started using it when I tried to play a movie with Windows Media player and it basically told me it did not support the format and that additional codecs was needed. Once I found, downloaded and installed what I thought was the correct codec, I soon discovered that I had thrown trash at my system that caused Windows Media Player to not function properly. Of course I was questioning; What is a “codec”? To be honest with you, I love tech stuff, but I really don’t care about “codecs”. If you get into the various digital media formats, the term “codec” will cross your path often. Per WikiPedia, “A codec is a device or program capable of encoding and/or decoding a digital data stream or signal”. What is so nice about VideoLan (VLC) media player is that it supports a large number of multimedia formats, without the need of additional codecs. It is not the prettiest media player out there, but it gets the job done and does it very well. If you are into appearance, VideoLan (VLC) is skinnable. Oh, and if you don’t know what a skin is; a skin is an add-on that you can use with VLC to change the look and feel of the player to make it more aesthetically pleasing to the user’s eye. VLC media player is a highly portable multimedia player for various audio and video formats (MPEG-1, MPEG-2, MPEG-4, DivX, mp3, ogg, …) as well as DVDs, VCDs, and various streaming protocols. It can also be used as a server to stream in unicast or multicast in IPv4 or IPv6 on a high-bandwidth network. It doesn’t need any external codec or program to work. I have tried numerous music players and finally settled with one called “Spider Player“. When it comes to music, it is all about personal preference. This player is small in size, but packs a big punch (2.87 MB for the Basic AND 3.58 MB for the portable version). I personally use the portable version (flash drive ready) and the best feature I like is the built in radio directory. The player will pull in thousands of internet radio stations from around the globe and generate a convenient directory listing. Once you find stations you like, you can save them to a favorites list. At first try, you may be a little confused on how to navigate the player; but, once you get the hang of it you will love it. If you have questions about the player, the site provides a forum and tutorials to help you out.